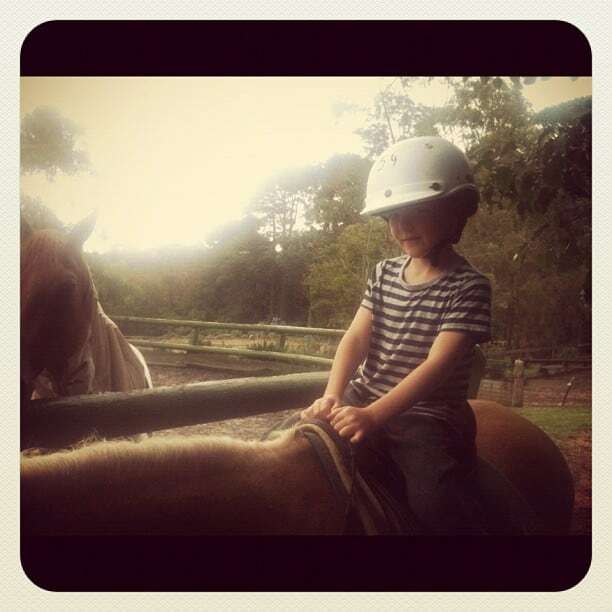 Pony riding in Sydney is fun and there are many family-friendly places to go. The twins had been asking to go for a pony ride for quite a while. So just before Christmas I called around our local horse riding centres and asked how we could go about getting them in the saddle. It was a damp and drizzly day when we went to the stables, but that didn’t daunt the enthusiasm of Ms5 and Rusty Rocket at all. So they were hoisted aboard a very pretty pony and I led them around the riding school for 15 minutes only. That was plenty for them. The riding school’s advice is to do a few pony rides then when they get bored start them on proper riding lessons. 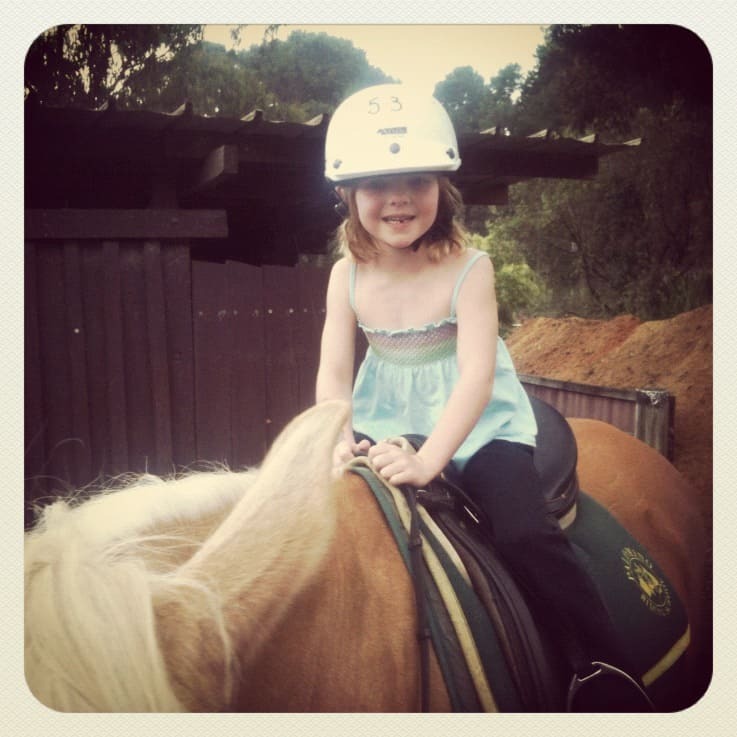 If you’d like to try a pony ride for your children, here are a few ideas of where to start looking. Centennial Parklands Equestrian Centre is probably Sydney’s best known riding centre. We’ve never had a ride around Centennial Park so I am definitely adding that to the list of family things to do in 2012. The NSW branch of Australian Horse Riding Centres has lists of accredited stables in Sydney and around the state. 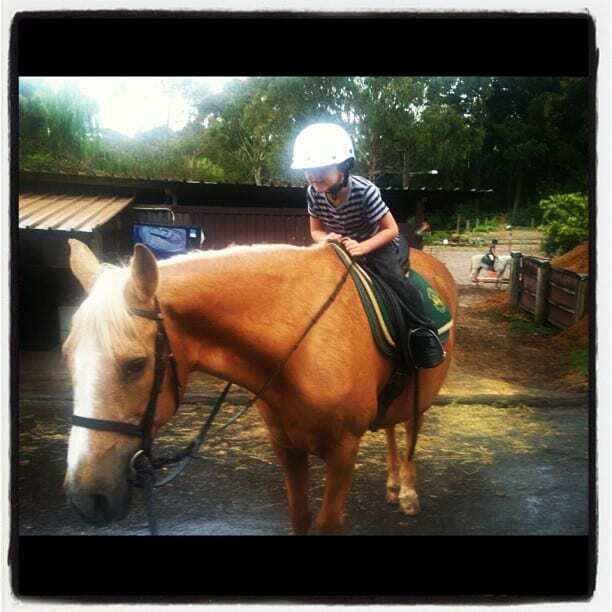 The national body Australian Horse Riding Centres website can be found at http://www.horseriding.org.au/ and has details of stables across Australia. 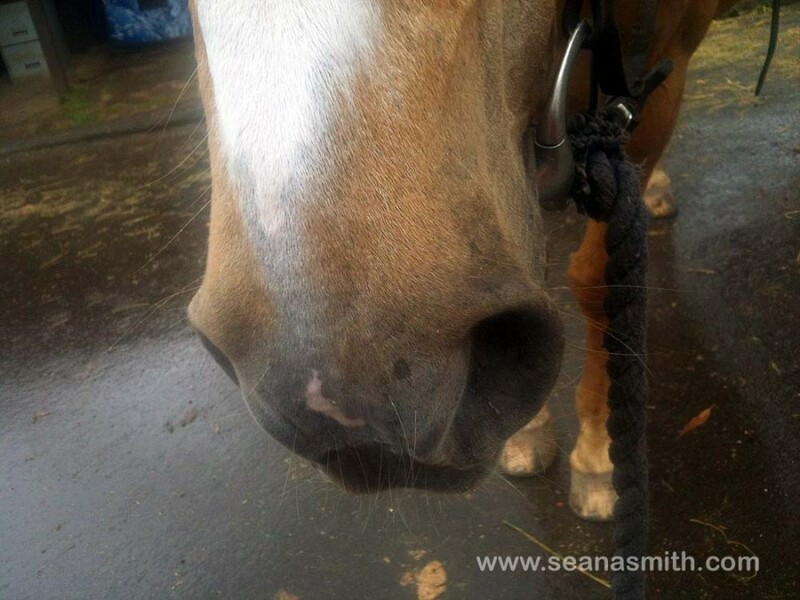 And finally, for your delectation, here’s a picture of the soft, warm, fuzzy nose of the pony. Noses are my very favourite bits of all hooved beasts, so lovely to nuzzle. Do you have pony mad children? Can you add any advice for other families looking to ride off into the sunset? My Pony Party offer family friendly riding for all ages. From lead rides to lessons or out on the trail, the care and expertise ensure safe fun riding for all at their sites in Ebenezer or Galston, at your site or as part of special riding adventures in national parks and other permitted venues. Visit http://www.myponyparty.com.au or find us on Facebook. Nice story, your twins look so cute. I remember my first pony ride experience with my kids, that was fun and unforgettable. It’s a lovely thing isn’t it? I got very excited when I saw your website URL as I thought you might be at the Gunnamatta in Sydney. One day I will come down to Victoria and visit you and come for a ride!